‘Old Tree Overlooking Abandoned Homestead, Gippsland, Australia’ shows the typical rural architecture of the Victorian state east of Melbourne. It is the region in which Moss painted most frequently. Gippsland was known for its timber industry, being at the foothills of the Alps, mining, power and cattle ranching. Corrugated iron was the most common roofing material and used even in Melbourne urban architecture. Examples were still visible, being often used for entire buildings besides roofs, during the artist’s stay there. Despite Australia having an important iron industry, the corrugated iron used extensively there in the nineteenth-century was imported directly from England being easily transported from the harbours of Sydney and Melbourne to the inaccessible bush. It was used in squatter homesteads and for the fast assembly of housing for settlers during the Gold Rush. 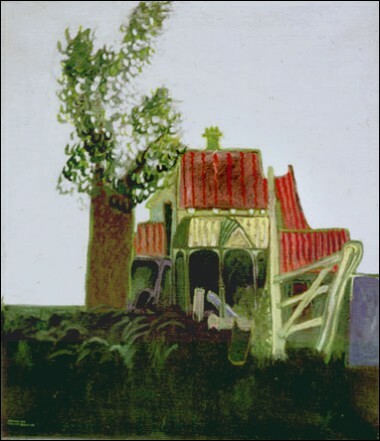 The building the artist depicts was in the Heyfield area of Gippsland The high pitched (and now, rusted) roof and the verandah protecting the house from the harsh Summer sun and heat are constructed in the strong and light corrugated iron sheeting. The veranda was an important feature of Australian architecture; one could sleep outdoors in the summer, and, in the winter, the musical rhythm of the rain beating on the tin roof put generations of Australian children to sleep at night. At the centre of the building, beneath the complex roof of the veranda and to the left, behind the flowering tree stump Matthew has painted traces of the remains of the building’s wrought-iron, filigree pillars and screens that were so characteristic of houses in Australia.